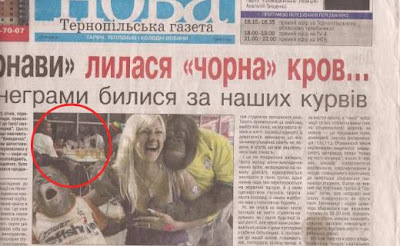 A local newspaper in the western Ukrainian city of Ternopil illustrated its front-page story on Tuesday with a photomontage of monkeys groping a woman to depict African and Arab men who had allegedly gotten into a bar fight. Our Observer, a Congolese student living in Ternopil, tells us this has deeply upset African students at his university, who he says are frequently the target of racist attacks. Nova Ternopil's article explains that police had to intervene after an African man and an Arab man got into a fight involving a woman at a local bar on the weekend. The headline reads, “Arabs and negroes fight over our prostitutes.” The photomontage shows two monkeys groping a white woman in the foreground. In the background, a group of black men are sitting around a table, having a drink. According to our Observer, the men pictured are students at a local university and had nothing to do with the alleged incident.